On the morning of 24 September 2017, AMDA team comprising personnel from AMDA and Tenrikyo Mexico Office entered the state of Morelos to conduct a needs survey in four locations. Morelos is approximately 150 kilometers south of Mexico City, the capital. The overall ground surveys revealed that much of the needs had already been fulfilled in Morelos (and Mexico City), hence, there seemed to be no need for emergency assistance. 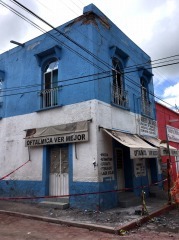 In Cuautla, the extent of the damage wasn’t serious. At a general hospital which was functioning as a local releif hub, there had already been enough medical goods as well as daily necessities. The needs were similarly fulfilled in two other medical facilities which the team visited later on. Medical services were already available with a sufficient amount of aid being delivered despite that the buildings were partically damaged. The situation was similar in Axochiapan, the epicenter, as well. 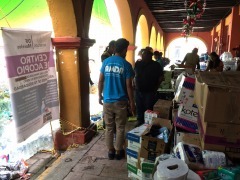 Meanwhile in Juchitan in the state of Oaxaca which was heavily devastated by the eartthquake earlier this month, it has been feared that transportation of relief goods could be affected due to the collapse of a main bridge after another quake that hit the region on 23 September. Juchitan is located 1,000 kilometers from the capital and is known to be one of the impoverished regions where a large number of population consists of indigineous people. In fear of isolation in the midst of time where relief has been concentrated in Mexico City, AMDA team will be moving to Juchitan for follow-up assistance.